Shea is very popular mainly because of the shea butter which is extracted from the kernels in the shea fruit. Shea butter is widely used in cosmetic products all over the world. The shea tree is grown in the dry savannah belt of West Africa, stretching from Senegal to Uganda, then on to parts of Ethiopia. Shea is a crop that does well in dry climate and takes up to 30 years to produce fruits at its peak. The shea tree continues to produce fruits until when it is about 200 years old. The leaves of the shea tree are used in processing the African locust bean into a condiment commonly known in Ghana as dawadawa and the bark of the shea tree is boiled and consumed as a beverage in Northern Ghana. There are several health and nutritional benefits you can obtain from both the fruit and the butter. Mostly, the emphases of the health benefits have been on the benefits of shea butter to the skin, and almost nothing about the fruit and how shea butter positively affects your health when you eat it. In this post, you find very interesting nutritional and health benefits of shea fruit and shea butter you didn’t know. The shea fruit has two main components: the pulp and the kernel (or nut). When the fruit is ripe, the fruit is green and the pulp is a yellow with a tart taste. The pulp is thin surrounding a relatively large kernel. It is from this kernel that shea butter is extracted through a series of processes including boiling, sun drying and roasting. The shea fruit pulp is low in sugar and high in dietary fibre, a combination that is suitable for weight loss as well as the prevention and treatment of type-2 diabetes. The pulp is packed with several nutrients including vitamin C, potassium, calcium and other natural healthful chemicals. Vitamin C is an important nutrient that helps to protect the body against diseases such as common cold, cataracts, stroke, heart diseases and cancer. The shea fruit pulp contains more than three times the vitamin C in oranges. Further, a review of studies indicated that eating the pulp from about 5 shea fruits provides about 90% of the daily amount of vitamin C needed by a healthy adult and about 300% of the daily amount of vitamin C needed by a child aged between 4 years and 8 years. Including fruits rich in vitamin C like the shea fruit in your diet will help your body to easily absorb the iron in plant sources of iron such as kontomire (cocoyam leaves), spinach and fonio. This helps to reduce the risk of iron deficiency anaemia, the commonest form of anaemia. Unlike sodium (example of a source of sodium is salt) which increases your blood pressure, potassium works together with magnesium to lower your blood pressure. As a result, it has been recommended that you reduce your sodium intake and increase your potassium intake. Further, you could include foods that are low in sodium and high in potassium in your diet. The pulp of the shea fruit, due to its low sodium and high potassium content, may assist in controlling blood pressure. This is critical, especially in our times where the statistics on high blood pressure and its related diseases are on the rise. Further, the shea fruit pulp contains more than twice the amount of potassium in mangoes. Adding the shea fruit to your list of fruits will go a long way to reduce your risk of high blood pressure. In addition to all these nutritional and health benefits, the shea fruit pulp has been found to contain some of the most potent antioxidants called phenols. These phenols naturally occur in the shea fruit, both in pulp and the kernels. The phenols in shea fruit have been shown to protect against infections and prevent cancers. Shea butter, often referred to as “women’s gold” in Burkina Faso, is the fat extracted from kernels of the shea fruit in a process which can take 3 – 4 days to complete. The extraction of the fat starts when the kernels are recovered from the fruit after consumption of the pulp. The processing to obtain shea butter goes from sorting and cleaning the kernels to crushing the kernels to roasting followed by grinding grits into paste, then the paste is kneaded. 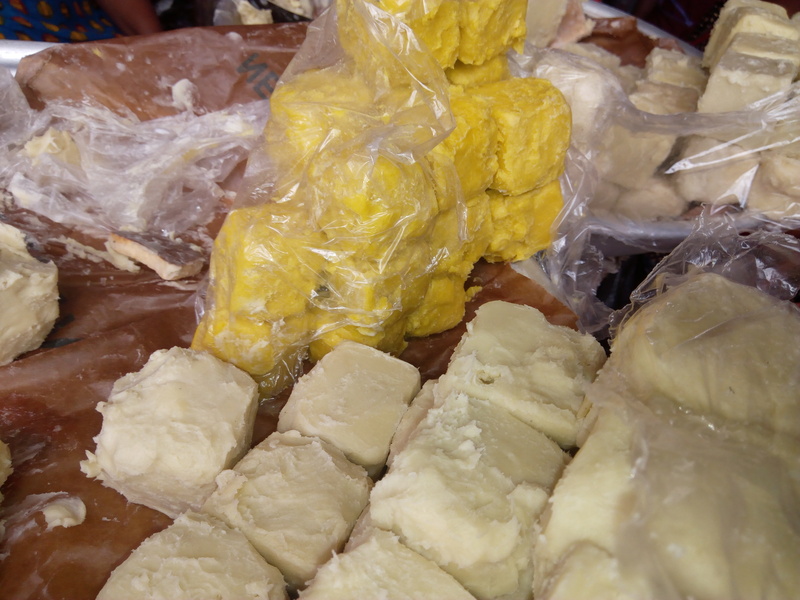 The kneaded paste is boiled and cooled and shea butter is collected. Though shea butter is mainly used in skincare products, some chocolates also use shea butter as cocoa butter replacers. Also, people in many communities that harvest the shea fruit and process the fruit into shea butter use the shea butter in many of their meals. 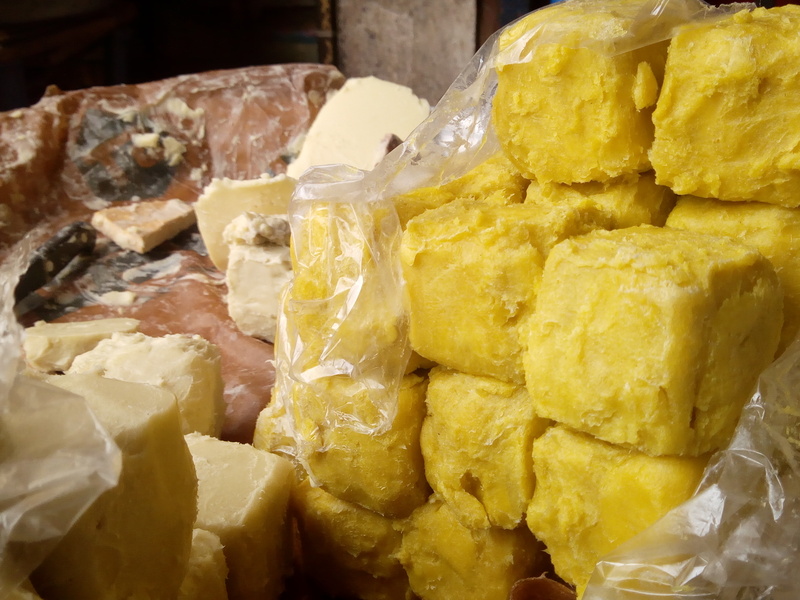 Particularly, in Ghana, those in the Northern part frequently use shea butter in cooking, and sometimes, it is eaten raw. Shea butter is a mixture of different kinds of fats. Fats are made of two main components; a backbone (called glycerol) and fatty acids. The backbone is glycerol for all fats. However, the fatty acids may be different for different fats. So, for a particular fat, there could be two or more different fatty acids while others may have the same fatty acid. In the case of shea butter, there are five different fatty acids; oleic acid (the same fatty acid in olive oil and sunflower oil), stearic acid (the same fatty acid in cocoa butter), linoleic acid, palmitic acid (the same fatty acid in palm oil) and arachidic acid (the same fatty acid in groundnut oil and groundnut paste). Three of the fatty acids in shea butter are saturated fatty acids, which are generally regarded less nutritious. However, recent studies have shown that the predominant saturated fatty acid in shea butter, stearic acid (which makes up about 40% of shea butter), is linked with a reduced risk of heart diseases, hence, shea butter is a healthier replacement for margarine. This is because margarine contains trans-fatty acids which are linked with heart diseases. Further, shea butter also contains lupeol, a chemical that lowers cholesterol and protects the heart and blood vessels against inflammations. Also, there are seven other naturally-occurring chemicals in shea butter that help reduce pain by reducing inflammations. Moreover, shea butter is a good source of phenols. One study that analysed shea butter from 10 of the 19 countries that grow the shea tree found that the kind of phenols in shea butter and their quantities are similar to that in green tea. These phenols are strong antioxidants that prevent cancers and heart diseases. Shea butter is also a rich source of vitamins such as vitamin E and vitamin A. These two vitamins do not only protect the skin, they help to promote good eyesight. In summary, the shea fruit pulp and shea butter offer great health benefits when they are included in the diet. Both are rich in potent antioxidants and nutrients that promote heart health. Start using shea butter in your cooking and share your experience with us in the comments section below. Share this article with your network, let them know the nutritional and health benefits of shea fruit and shea butter.